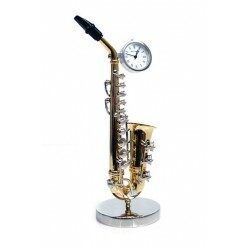 Pencil Saxophone set of 2, black..
A perfect gift for any saxophone player or music teacher. Each SAXOPHONE Mug is presented in a ..
An ideal gift for a saxophonist or music enthusiast, this white Cappuccino Mug is decorated with a b..
A6 pocket notebook Saxophone. Half lined, half plain paper with an elastic closure to keep all your ..